Individuals will be given Signs to hold. Two people will play the Gate In, and two others the Gate Out. Extensive Production, Character and Staging Notes are at the end. (The Storyteller enters and places the Signs with the audience members in their particular places (See Figure 1 Model), explaining their task is to listen and, when their sign is mentioned by a character, to hold it up for a minute.) The three Road of Trials signs are at the Gate In, Nigredo, and Gate Out areas. The Gate Keeper selects two pairs of people and gives them their signs, teaching them the signal for when to rise and become the Gate In or Out. When all are ready, the Storyteller begins in the Home area. Throughout the archetypal characters as Chorus echo softly underlined words as they are said, but in different pitches and speeds. These may be individual voices or the Chorus as a whole. Home can be anywhere, anytime, anyplace, in the kingdom of… near the forest… in the city. As the Storyteller I often begin by telling you immediately about the Homeplace, the state of birth, the Status Nascendi, the place where the story begins. (To Audience) There will be questions for you from time to time. They help you remember your story. Please answer when asked the question. Here’s the first one: where is Home for you? Once we know where Home is, next I’ll tell you about the Situation at home. There’s a drought, or it’s been raining for forty days and forty nights. There’s a war, or something scary in the forest no one can get rid of, perhaps a dragon. If all is going well in the land so far, the Royal Family may lack either father or mother, or they slighted a thirteenth fairy whose curse has their daughter sleep for a hundred years. At home, there is always some Situation. Storyteller: “Once upon a time”… The story will be about a hero or heroine who usually has two brothers or eleven sisters or is sometimes an orphan. The hero, the heroine in this story is named EverySoul. EverySoul: (Wearing the white scarf.) This is my home. In whatever time we are, I come from this place. I live here, and I’m usually working. I rarely get along with my family. I am often called Stupid, Simpleton, or Cinders. In this story I am called EverySoul. I am a good sort of person, often cheerful and patient and kind. I have good manners, and I can follow instructions. Storyteller: EverySoul will leave Home because of a “Situation”. EverySoul doesn’t know yet about the journey through the Road of Trials. EverySoul: I want to leave Home, the place from where every one starts out. I’m bored, tired, or itchy, irritable, sleeping a lot or frantic. I want my life to change! I want to start school or graduate, to marry or divorce, to find a job or leave it… all I know is something has to change! (To audience) What are the changes you want to make? What’s next in your life? Storyteller: The story advances quickly. There’s a Call. Sometimes it’s an announcement from the King, asking for help in solving a problem. Sometimes brave young people are asked to do something foolhardy at the cost of their lives. Sometimes the family needs something – money, or a cooling fire, or a horse. There’s often a prize, which may be why our hero or heroine leaves home. EverySoul: I’ve heard the call. I want to leave home. Should I go? Maybe it’s better to stay home. Will the family let me go? Probably not. Storyteller: In the story, if EverySoul has siblings, they usually go on the journey first, and end up lost or dead. EverySoul: There’s some thing I am supposed to do, to help out, to find the Grail, to win a prize. Maybe, at last, it’s my time to go. Storyteller: Sometimes in the story the Home situation is such that it is hard for EverySoul to leave on the journey. EverySoul: I’ve noticed that when I don’t or can’t leave, things seem to get worse. Storyteller: If the family really gets in the way, something awful can happen. Hundreds of letters fly into the sealed up house. Or the Empire Storm Troopers come through and burn out the uncle’s farm. EverySoul: I feel like I either have to get going or I will die. I’m going now, no matter what the cost! Old One: Hullo there! I’m called Old One. I enter the story after EverySoul leaves home. I can be a man, woman, fairy, dwarf. I can be an animal or bird. I can be a vision or dream. I’m here to help you out. EverySoul: My name is EverySoul. Old One: It’s good finally to meet you, EverySoul. It’s possible I met your older brothers earlier. If so, I hope you are an improvement. Whither away? EverySoul: What did you ask? Old One: Whither away… oh, never mind. Where are you going? EverySoul: Mostly I’ve been leaving Home. I am on my way to someplace else. Old One: Yes…most people leave home on their way to someplace else. EverySoul: When realize that when I left home I didn’t think very much about where I was going. Old One: Do you know that in a journey the first step is to lose the way? Chorus: (Snarly, impatient, different pitches and speeds.) Did you know that in a journey the first step is to lose the way? EverySoul: No. I go I know not whither, to bring back I know not what. Old One: It’s right here in most stories that I ask you for some food, money, or your cloak. Will you share with me? EverySoul: Of course! Here’s a crust of bread, and my bottle of water. You could have my money if I had any, or my cloak, if I had one. Old One: Thank you, EverySoul. You have a generous heart. That’s good. EverySoul: I’ve been called a fool, you know. Old One: I know. I prefer fools, myself. Tell me, why did you leave Home? EverySoul: I heard the Call. Old One: You heard the Call. And now, here you are, pretty much on time, looking for the Gate In. EverySoul: I might be looking for the Gate In. Is that it? Old One: Yes, that’s the Gate In. Because you’ve been generous there are a few things I’ll tell you. If you listen to these suggestions they will help you get to and through the Gate In. On the way there may be a Field of Bones, dogs or demons, a Giant, the Troll, who intends to marry. Gate Keeper: Don’t forget the Dragon. EverySoul: A dragon! Oh, that’s scary! I’ve never met a dragon before. Old One: Not a whole lot of people meet a dragon before they get here in the story. The dragon will have a Golden Key. It’s the Key to the Gate In, of course. You’ll need it to open the lock. EverySoul: I need the Golden Key to open the lock to the Gate In. Do you know how I find the dragon? Old One: Once you start to look – you’ll find it. EverySoul: Oh. Well, then, how do I get the key from the dragon? Old One: Generally by dancing with it. EverySoul: Dancing with the dragon? Old One: I hope it will work for you! EverySoul: Do you have any other advice for me? Old One: There will be Guardians near the gate. I think I’ll give you back the bread. You’ll need to feed the Guardians before you can get near the Gate In. EverySoul: Well, I got through that pack of dogs without getting chewed up. That task was hard, but at least I’m not at home any more. (Wanders, singing.) If I thought things made practical sense or went in a straight line before, I have a feeling that’s over now. (Wanders, singing.) I have to find the Dragon with the Golden Key. Oh, oh – this looks like a Field of Bones. It’s asleep. How do you ask a dragon to dance? How about “wanna dance”? Probably not. “I’ll bet you’d like to dance?” No, that’s not right. (Goes up to dragon, bows.) May I have the honor of asking you to dance? With me. Oh! You would! EverySoul: Thank you for the dance, Dragon. What’s in this bag you have given me? Here is a skeleton key. To the Gate In, I’ll bet. Thank you. What else is in here? Baby dragon teeth? Yours? Well, thank you for them too. EverySoul: Oh, look! I’m at the Gate In … to some place else. Gate Keeper: (To EverySoul) Planning to go through the Gate In? EverySoul: I am. I’m EverySoul. Gate Keeper: I’m the Gate Keeper. Have any difficulties finding the Gate In? EverySoul: I wandered a little, met the Old One and a pack of dogs. Then I went through a Field of Bones, and danced with a dragon. It doesn’t seem so difficult now that I’m past it and am here at the Gate In. This is the Gate In to … where? I have to ask you – did you come here by free will or by compulsion? Chorus: (Snarly, impatient, different pitches and speeds.) Did you come here by free will or compulsion? EverySoul: Hmm…a little of both. Free will at first, but I’d say by now it feels more like compulsion. Gate Keeper: Good! Compulsion helps you get through the Road of Trials. EverySoul: The Road of Trials. This journey already has been a little more work than I expected! Dogs, a Field of Bones, a Dragon. Gate Keeper: This journey is not easy. And it’s always a little tough when you meet the Other. Gate Keeper: Yes. Yes! Meet the Other. The non-human. The archetypal. The mythic. The Sacred. The Other. EverySoul: It was more scary than Sacred, I thought, personally. But, now I have the Dragon’s Golden Key to the Gate In. Gate Keeper: If you have the key, go ahead and use it! EverySoul: Well – now I’m through the Gate In. I guess I’ll be moving along. Gate Keeper: Wait! You need to leave the key – the next seeking soul will need it. EverySoul: Shall I leave the dragon’s teeth too? EverySoul: Will I see you again? Every Soul: Call the world, if you please, the vale of soulmaking. Then you will find out the use of the world. Storyteller: Once through the Gate In EverySoul begins the Road of Trials. Now we will get to see if EverySoul has the backbone for the rest of the story! Companion: Howdy! Fancy meeting you here! EverySoul: Hi! Do I know you? Companion: My name is Companion. I’m your ally. You don’t have to be here by yourself, you know. My other names are Farseer, Sharpshooter, Puss in Boots. Little John. Chewbacca. EverySoul: My companion, my ally? Companion: Yes. I’m here to help you walk the Road of Trials. I have a lot of useful tools. I have a compass, a spyglass, a bag of earth, a magnifying glass, a piece of rope… oh, and a Reader’s Digest version of Joseph Campbell’s Hero’s Wheel. EverySoul: Will we need all that? Companion: We might; I just want to be ready. Companion: The Road of Trials! The trials are tests of your mettle, which you must meet with valor. EverySoul: You know, when I left home I did think there might be some difficulties ahead. And I’ve had a few already. But now – test my mettle? Meet with valor? Companion: Yes. This Road of Trials lasts all the way to the Gate Out. EverySoul: Where is the Gate Out? (Looking around. Companion hands over the spyglass, searching for it.) That’s a long, long way from here. Does it take a long time to get to it? Companion: It takes a long time or a short time, or a year and a day, to get from here to the Gate Out. Chorus: Temenos. Chorus adds individually Belly of the Whale, Labyrinth, Wasteland. EverySoul: I don’t know where we are or where to go next. Companion: That’s because we’re thoroughly lost in the unfamiliar. EverySoul: Look. This says “Instructions”. (Reads.) In three days you must sail the seven seas, climb the glass mountain, steal the goose…”. It goes on some after that. EverySoul: It looks like we are at the edge of the first sea. Companion: And look – here is a small sailboat, mast, sails and all. EverySoul: It’s as if the boat is just waiting for us! Companion: So often the right thing arrives at just the right time. Storyteller: They rig the sails. (Pause.) They cross the Placid Sea. EverySoul: Sailing this sea isn’t so hard. Companion: It’s the first sea. I think we’re lucky! Storyteller: On the second sea there are swells. Storyteller: There is a storm on sea number three. Companion: This storm is too fierce! Take in the sails! Storyteller: Sea number four is calm – so calm there is no wind. Storyteller: Sea number five has icebergs! Storyteller: Next – a whirlpool! Chorus: Sea number seven has rocks! The boat is sinking. Companion: Whew! We crossed the Seven Seas! EverySoul: Here’s a sign that says “Glass Mountain.” (Audience member raises sign.) But where is it? Companion: I don’t see any Glass Mountain either. It has to be here somewhere. Companion: Slippery and completely smooth. EverySoul: How can we climb up it? Companion: If we had wings we could fly to the top. EverySoul: We don’t have wings, but that idea gives me an answer! I know what to use – the dragon’s baby teeth! Companion: You have a dragon’s baby teeth? Perfect! Here’s what we’re going to do. You climb up a little way, using the teeth to make hand and footholds. EverySoul: (Starts to climb – all pantomime.) This glass mountain seems to be shaped like a pyramid. We don’t have to go straight up. Companion: That’s good. I’m going to throw up my rope. Pull me up to where you are. EverySoul: I’ll go ahead, and then throw the rope down to you again. EverySoul: How much further is it to the top? Companion: How much further do you want it to be? Chorus: (Snarly, impatient, different pitches and speeds.) How much further you want it to be? EverySoul: Oh. Well, then, I want this to be the top. We’re at the top right now. Companion: Good! (They finish climbing to the top, look around.) Now, what’s next? EverySoul: Catch the Golden Goose. There it goes. Companion: You caught it! Good job! EverySoul: We have sailed the seven seas, we’re at the top of the Glass Mountain, and I have the golden goose. Can we sit down now and rest? Companion: We’re not through the list of instructions. What’s next? EverySoul: (Holding the goose, EverySoul looks for instructions. Hands goose to Companion.) It says Nigredo. And that’s all it says. Where is this Nigredo place? Companion: (Hands goose back to EverySoul.) The Nigredo is down there. EverySoul: There is nothing on these instructions about how to get there or what will happen to us when we do. Companion: The Nigredo is half way through the Road of Trials. EverySoul: I’d like to point out that I am tired, and a little frustrated. Companion: Come on! This is a glass mountain! We can slide down there! EverySoul: I am worn out from all these trials and labors. Companion: Worn out or worn down – either way there is a major transformation up ahead. Witch: Had a long growing season, which intensifies the flavor. Has character and backbone. A little sweet, but gaining spice. Good quality and intelligence. EverySoul: Are you a witch? Witch: It doesn’t matter if I am a witch or not. EverySoul: Do you live in this Nigredo place? (Looking around.) It’s a place of dust and ashes. It’s very dark here. Witch: None of that matters either. It’s time to transform, here, now. EverySoul: I feel this is time of despair. Witch: In the cocoon, dissolving to jelly. No teeth, no eyes, no wings, no belly. Caterpillar’s gone now; EverySoul is learning. Winds toss, water drowns, heat dries. Predators offer grins, nods and lies. EverySoul cooks. A Self is forming. StoryTeller: Here at the center of the Road of Trials is the transformation point, the Nigredo. Witch: (Addresses audience while tending EverySoul.) The Nigredo! A place of development. A place of transformation. Tell us about your transformation! What transformations led to your development? Witch: I cook with no real sense of time – or when it’s hot enough to transform. But I think we’re almost there. Come along, EverySoul, transform! Companion: Come on, EverySoul! Transform into your Self. Give me an S. Give me an E. Give me an L. Give me an F. What have you got? SELF! Companion: This event is called the Dark Night of the Soul. EverySoul/Self: (Exhausted) That’s a good name for it. Witch: Here’s a gift from the Dark Night of the Soul – the Water of Life. EverySoul/Self: The Water of Life? For me? Witch: The Water of Life – yours for the taking! EverySoul/Self: Is there anything in it? EverySoul: (To Audience) Have you found the Water of Life? Can you tell me what brings you back to life? EverySoul/Self: Thank you, Grandmother, for seeing me through. EverySoul/Self: (To Companion, happy.) Am I done now? Companion: Done with the Road of Trials? No. Remember the Nigredo is about half-way through the journey. EverySoul/Self: Half-way! How much time is the rest of the journey going to take? Companion: Depends. You can decide to sit down right here. Or you can wander around in this Temenos for years. Or we can get going. EverySoul/Self: I don’t think I’m interested in the first two choices. Let’s get on with it. Companion: On this side of the Nigredo, you lead the way! EverySoul/Self: (Looks around.) I seem to have lost the instructions. Companion: That’s probably just as well. Old instructions useful before your transformation may not be that useful for you now. EverySoul/Self: No instructions? All right then. Is this the way? Companion: Only you can figure it out. (Taking a compass from a pocket.) Here’s a compass. EverySoul/Self: Thank you. (Finds North.) Looks like north is this way. But – don’t you think first I need to know where I’m going? Companion: I always think it’s a good idea to know where you’re going. EverySoul/Self: How do we get out of here? Companion: There are a lot of different ways to get out of here. EverySoul/Self: Why don’t you just tell me one? Companion: Because it’s an individuated, different experience for every soul. EverySoul/Self: Do I get any clues, hints, maps or instructions? Companion: I can ask you questions. EverySoul/Self: I’d like to look through the spyglass, please. EverySoul/Self: This way to the Gate Out. We seem to be going in a circle. I said we seem to be going in a circle. Companion: Oh, I agree! We’re definitely going in a circle. It’s very repetitious. Companion: Can you remember what you are doing on this journey? EverySoul/Self: I seem to have forgotten what is it I am doing. Why am I here? Companion: Why did you come here? EverySoul/Self: I wanted to change my life. EverySoul/Self: I changed myself. I transformed. Companion: And now what do you want? EverySoul/Self: I’m so tired. I want to rest. Companion: How do you keep your focus? EverySoul/Self: I’m going to take a short nap. Companion: You could sleep through a whole part of your life… or as long as a hundred years. EverySoul/Self: I’m going to lie down here. StoryTeller: The Guardians at the Gate Out have names like Distraction… Exhaustion … Despondency. It takes at least as much courage to go through the Gate Out as it did to come through the Gate In. In the cocoon, dissolving to jelly. No teeth, no eyes, no wings, no belly. Caterpillar’s gone now; EverySoul is learning. StoryTeller: Here’s where we are in the story. What remains for EverySoul is to assimilate what’s been learned, constellate person or Self, and then figure out how to live in the pragmatic world. That’s all. But it’s tricky. StoryTeller: Lots of Selves quit at this point. Giving up is really quite easy. The culture will help. Instead, we can help EverySoul remember the Nigredo, the transformation. Let’s say the Witch’s poem aloud. Audience: In the cocoon, dissolving to jelly. No teeth, no eyes, no wings, no belly. Caterpillar’s gone now; EverySoul is learning. EverySoul/Self: (Stops singing, stretches, gets up.) I am not going to stay down here. Companion: I’m so glad to hear that! EverySoul/Self: Where’s the key to the Gate Out? Companion: Remember, on the Way Out I only can ask questions. In terms of the key to the Gate Out, here’s an important one: what is the gift you are taking out of here? EverySoul/Self: What gift am I taking out of here? What gift? I’ve lost the instructions. I have a bottle of the Water of Life. Is that the gift? Companion: It’s a useful gift given to you. What useful gift are you going to give? Companion: I can ask you this question: What story are you in? EverySoul/Self: What story am I in? This one! My story! EverySoul/Self: I am living my story. I have me. I got through all that. (Looks back down the Road of Trials.) Maybe I’m the gift; maybe what I know and am will be useful to someone else. Companion: I’ve learned a lot with you on this journey. I believe you are the gift. EverySoul/Self: I am the gift? I am the gift! O.K., I’m the gift I’m going to give to others. Companion: Look! Here we are at the Gate Out! And here’s the Gate Keeper! Gate Keeper: Congratulations on making it to the Gate Out! EverySoul/Self: Thank you! Come on, Companion, let’s go through the Gate Out. Companion: I leave you here. EverySoul/Self: You leave me here? You aren’t going through the Gate Out? Companion: I have things to do here. You have things to do there. For now, we part ways. I enjoyed being your Companion. EverySoul/Self: I’m thankful to have had you for my Companion! Gate Keeper: I have to ask you – what is the gift you are taking out of here? EverySoul/Self: Myself. I am the gift I’m taking out of here. Gate Keeper: You don’t want the prize – the Hero’s Crown? EverySoul/Self: What’s the Hero’s Crown? Companion: It’s a prize for getting through the Road of Trials. It takes different forms for different people. A diploma. A driver’s license. The start-up earns a profit. A trip around the world. EverySoul/Self: I remember something about a prize. Gate Keeper: What is the prize – the Hero’s Crown for you? (Audience responses). EverySoul/Self: I’ve learned a lot. I like the idea of being of use to others… I think doing what I want to be doing is my Hero’s Crown. Gate Keeper: I agree. Make your experiment of life. Gate Keeper: Where are you off to, then? EverySoul/Self: (Thinks about it; is a little surprised.) I think I have to… go Home. I happen to have a bag of earth from Home. Want it? EverySoul/Self: What would I do with it? Gate Keeper: It’s the ground on which you stand. Gate Keeper: Put it in your pocket with the Water of Life. EverySoul/Self: I will. Thank you. I’d best be on my way. There is so much to be done. Gate Keeper: Yes, there is so much to be done. Here’s some advice: don’t wear yourself out. EverySoul/Self: I’ll be sure not to over do it. Storyteller: EverySoul is through the Gate Out. The next dangerous part of the journey is the Return. It’s on the Return that Theseus forgets to change the ship’s signal flag and his father dies. Here the Water of Life is lost to the older brothers. Here Psyche, carrying Persephone’s Beauty Box out of Hades – falls asleep! On the Return much that’s been gained can be lost. Old One: I see that you won through the Road of Trials, found the Gate Out, and are on your way Home. EverySoul/Self: Thank you for your advice on the way in. It was useful. Old One: You didn’t want a prize like half the kingdom? Or a bag of gold? EverySoul/Self: What would I do with any of that? Old One: Run the country? Make a lot of money? Have anything you want whenever you want it? EverySoul/Self: If those things come my way, I’ll try my best to do well by them. In the meantime, I have me. EverySoul/Self: Any advice for me on this side of the Gate Out? EverySoul/Self: I thought you might say “Stay awake”. EverySoul/Self: I know I will find my way. Old One: For you, portals will open wherever you go! Storyteller: Stories end, generally with a marriage or an award ceremony. Sometimes there’s a phrase like “they lived happily ever after”. However, for EverySoul there’s no “happy ever after” this time. And that is how it should be, because EverySoul will spiral along a different Road of Trials, relatively soon. To provide for the audience Joseph Campbell’s Hero’s Journey, a proven, central model of development that all people go through, not only once but over and over in their lives. To review or introduce Carl Jung’s ideas around transformation and individuation as one psychological foundation for the Hero’s Journey. To keep a light touch by suggesting numerous storylines that are familiar to most audiences because to recognize where one is in the story offers an individual hope in times of despair. Transformation is not an easy task. In keeping the general light touch, do not minimize the work necessary on the Road of Trials, in the Nigredo or on the Return. The audience participation is critical to involve them in the story at a personal level. The first two questions (below) come very early in order to set the stage for this opportunity. The actor must solicit answers before going on. Having a handout ahead of time and/or a backdrop with the Wheel and the Questions visible is useful for the audience. Some of the characters address and interact both with other characters and the audience. Archetypal Others are onstage as audience arrives, seated in chairs placed in the four directional aisles, and are largely non-participatory, except as Chorus, until called into action. EVERYSOUL/SELF – Character is androgynous and not cynical. This character’s development and transformation is the heart of the play. STORYTELLER – illustrates the narrator function in myth and story. CHORUS: all characters have opportunities to be part of the chorus. Chorus lines, particularly the repeated words, can be delivered as a group, or by individual members of the chorus. Watch that the volume can be heard by the entire audience, but isn’t so loud it drowns out the speaking character. An example: Once we know where Home is, next I’ll tell you about the Situation at home. There’s a drought, or it’s been raining for forty days and forty nights. There’s a war, or something scary in the forest no one can get rid of, perhaps a dragon. If all is going well in the land so far, the Royal Family may lack either father or mother, or they slighted a thirteenth fairy whose curse has their daughter sleep for a hundred years. At home, there is always some Situation. In respect to the difference of the psychological realities, our preference is that the characters outside the Temenos area are not doubled with those within, although the temptation seems built into the script. If you must do it, consider having the characters exit and return in a completely different costume and characterization. Performed in the round with four aisles on the cross-quarter (lunar) diagonals from the Call and Return to the opposite side of the circle. At the beginning the Old One sits in the Call aisle, and crosses to the Return chair, EverySoul begins on the Return cross, the Companion on the opposite aisle from Return, and the Witch on the opposite aisle from Call. The Gate Keeper sits with the audience near the Gate In, crosses to Gate Out. 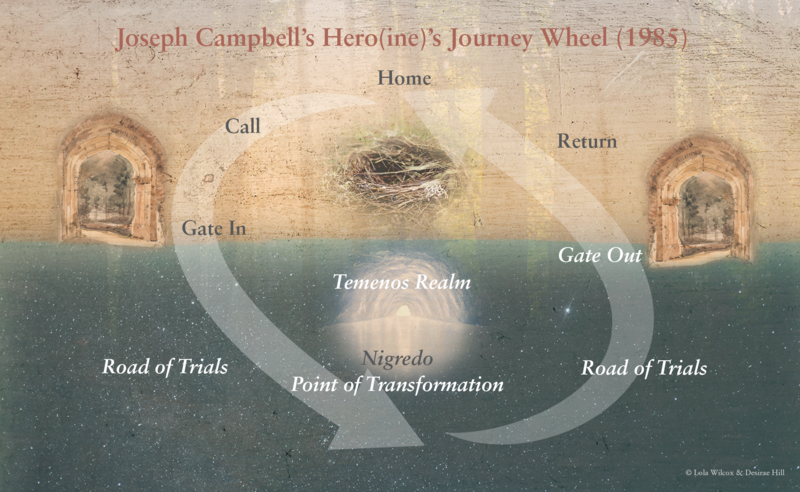 Joseph Campbell’s Transformational Journey Stages are the basis for both set and the blocking movement pattern. The counterclockwise direction is indicated correctly; once through the Gate In neither time nor directions of the pragmatic world apply. Use an in-the-round open stage area. Minimum space is 15 feet (square), radius is 7 feet. A backdrop with the Hero’s Wheel and the Questions could be hung behind Home. Actors are dressed in black street clothes with various decorative additions (hats, vests, shawls). The Companion needs a vest with many pockets. Witch wears a long black dress, or a graduation robe, or other loose black garment. The traditional pointed witch’s hat has a hatband of rose-colored roses. Storyteller may carry a storybook with Campbell’s Wheel on the cover. Storyteller needs a Megaphone – may be rolled up piece of paper, a conch. 1 white cloth, similar to the Buddhist neck scarf for initiates. This is worn by EverySoul from the beginning to the Nigredo. 1 large black cloth for cocoon; net allows the actor to breathe, and look mysterious when wrapped up. 1 red cloth worn by EverySoul/Self, to indicate post-transformation return. The Companion’s vest has a compass, a bag of earth, a collapsing telescope, a magnifying glass, perhaps a piece of rope, and a program folded so the Hero/ine’s Wheel is visible. Dragon is a group of very long (4 to 5 yards) multi-colored streamers swiveling on a two-foot long dowel, about 1/4” to 1” in diameter. There is a skeleton key and a bag (stiff cloth) of dragon’s teeth (mimed?) that will be found and used by Everysoul. Beside production details, actors, director, etc. please include the key questions on the audience program, perhaps on the back page.